The Sunday Salon – I Need Your Advice [6.5.11] – my books. my life. I need your help. I leave for the big European adventure on Wednesday. I have my iPad all loaded up with ebooks. But I can’t decide which print book to take. Yes, I said book. Singular. I am trying to travel super light so I am only going to bring one print book with me. For take offs and landings and any other time an ebook is impractical. I need the book to be long enough to last the trip but interesting enough to keep my attention. I have narrowed the pile to 5 books. This is where you come in. Let me know in the comments which book I should or shouldn’t bring. I want arguments for and against any of these. Please, please, please help my with this decision. (Haha – I just realized that two of these books have “American” in them). This week is Audibook Week, hosted by my lovely friend Jen at Devourer of Books. You should all head over tomorrow there and check out the good times that will be had. Here at my books. my life., I will be posting a discussion post about audiobooks in the morning and an audiobook review in the afternoon. I wanted to give you all a warning that this will result in a lot of posts this week. But they will be full of win. I promise. And finally, I will be keeping the blog going while I am gone this month but I won’t be around responding to comments and such like I usually am. I’m not leaving quite yet but I wanted to give you all a heads up. Hm, I think I vote Cutting for Stone. The only one I’ve read is American Wife, but I thought that one was amazing. I don’t know how helpful my vote will be. I would either read The House of Spirits (which I’ve read and absolutely love) or American Gods (which I really want to read, but haven’t gotten around to). Such a difficult decision! I haven’t read any of them so I’m not sure I can help. Cutting Stone is supposed to be excellent. I probably won’t update the blog with pictures while I am gone but I will try to get some on facebook so look there. I would have to say bring Cutting for Stone. I have heard so many amazing things about that book, and have wanted to read it myself for such a long time. I would advise against American Wife, as it is a bit slow and more of a character driven novel than a plot driven one, which isn’t bad, if that’s what you are looking for! I’d say American Gods. It’s not so heavy and not my favorite Gaiman, but it is still a very good read! 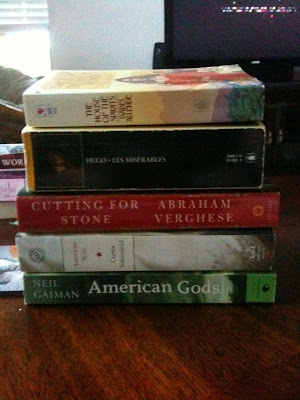 I have read Les Miserables, American Wife and Cutting for Stone. Out of those three, I would recommend the last two! Les Miserables is good, but it didn’t really engross me or keep my attention. Please please please read The House of the Spirits. It’s compact and absolutely fantastic. I vote Cutting for Stone, but only because it is the only book out of five that I have read. I did love it. So did Rebecca and Amy. Um.. Not sure what else to say except that I hope you have a very good trip! And also, that you should add a stop in the Netherlands next time. (Not that, I admit, the country itself is that interesting). I would love to stop by The Netherlands but we just couldn’t swing it this time. I think your country is interesting. Plus it has you! American Gods is a good one. I am also putting in a vote for Les Mis. Have a wonderful trip! Hope you enjoy the sights, sounds, smells of Europe! Looking forward to seeing the pictures. The only one I’ve read of the five is American Wife. It was good but not great. I’ve heard great things about Cutting for Stone, though. I vote Les Mis, since it’s the biggest, and it’s a major classic and it would feel good to accomplish that! i vote for american wife because it is engaging but relatively mindless. it is for reading on a plane, right? Says Ms. I-go-to-South-Africa-and-Italy-all-the-time. 😉 Thanks! Les Miserables is a fantastic classic that you really need to read. But for now, I vote for Cutting For Stone, I’m almost done listening to it as audiobook, it is extremely well written, hauntingly beautiful. And the audiobook is so well done as well. I haven’t read any of these but none of them really seem like page-turners. Is that what you’re looking for? A page-turner or just an epic story? I’m reading Cutting for Stone now and really liking it. It’s long, plus it’s not a super fast read, so it should last. My second choice would be American Gods. I haven’t read it yet, but it’s the next Gaiman on my list. I also hope to read Les Mis at some point but know I’d hate to be stuck with something so dense as my only reading choice. Might just be me, though! Have a great trip! I would suggest Cutting for Stone. Like others mentioned before me it is long and good. I felt like it was a book to savor. I wanted to know what happened next, but it wasn’t a book I felt I just had to rush through.